TAIWAN: Onshore cable installation works have begun for state utility Taiwan Power's 109.2MW Changhua offshore wind farm. Taiwanese subcontractor Star Energy Corporation is currently installing cables in a 13km underground track of duct banks. It will eventually connect the existing onshore substation to the cable interface near shore. 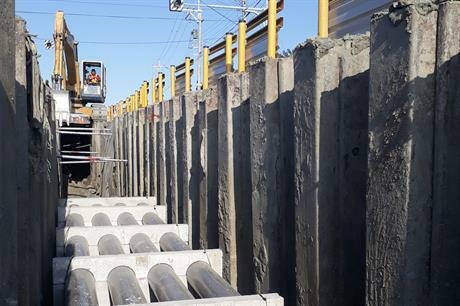 In this first construction phase, two kilometres of horizontal directional drillings will be carried out at 13 different locations and 45 prefabricated manholes will be installed. Overall, the onshore works will take Star Energy Corporation 20 months to carry out, offshore contractor Jan de Nul stated. Jan de Nul and Hitachi were awarded the contract for the site’s design, manufacturing, installation and maintenance in April, around the same time that Taiwan’s ministry of economic affairs (MOEA) allocated 3,836MW of grid capacity to ten other other offshore wind projects. Changhua’s connecting submarine cable will be installed in 2020. The project will eventually consist of 21 Hitachi 5.2MW turbines capable of withstanding cyclonic waves and winds and earthquakes. It will be situated off the coast of Fangyuan in western Taiwan. Manufacturing of the foundations and wind turbines is planned to start in 2019 and delivery is expected in early 2020. Tests will follow in summer 2020 and project commissioning is expected by December of the same year - just ahead of the projects awarded grid capacity in April. Taiwan currently has just one offshore wind farm in operation — the two-turbine 8MW Formosa 1 pilot project. However, this year its MOEA allocated grid capacity to projects with a combined capacity of around 5.5GW. The last of the 14 successful sites in the country’s offshore tenders are due to be online by 2025.